An intriguing programme has been put together for this issue, consisting of Shostakovich’s four most substantial works for piano, namely the two solo sonatas and the two concertos. The latter are both popular (especially no.2 thanks to Classic fm), but the sonatas are heard much less often. Sonata no.1 is a remarkable work; written in 1926 when Shostakovich was still a student, it is a powerful, in some places brutal work, which, in its percussive use of the piano, owes something to early Bartók. Only twelve minutes long and in a single movement, it packs quite a punch, and Peter Donohoe turns in a stunning performance, relishing the required assaults on the lower reaches of the keyboard. The second Sonata was composed in 1943, between the monstrous 7th and 8th Symphonies, and is dedicated to the memory of Shostakovich’s favourite piano teacher, Leonid Nikolayev. It doesn’t have the same untamed use of keyboard sonorities as the first, but is a much more spacious and extended work. There are also instances, particularly in the Allegretto first movement of the same faux naïveté that one frequently finds in the string quartets of this phase of his career. The Largo contains passages of spooky nocturnal perambulation, while the finale begins with an unaccompanied right-hand melody that I half expected to be treated as a fugue – it never really is – reminding me that the composer’s next work for the piano was indeed the 24 Preludes and Fugues of 1950. This movement is easily the longest – getting on for the length of the other two put together – and also the most complex, but such is Donohoe’s concentration and responsiveness to the shifting mood and character of the music that the somewhat disparate structure holds together convincingly. 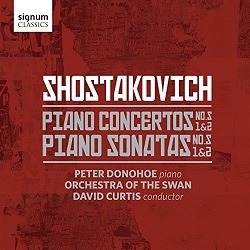 The Concerto for Piano, Trumpet and Strings (better known as Piano Concerto no.1) has always been amongst my favourite early Shostakovich works. It abounds with that enfant terrible abrasiveness, but also contains the gorgeously beautiful slow waltz that characterises the middle movement. Then there’s the madcap finale, with its cheeky trumpet tune and Keystone Cops conclusion. Donohoe is again superb, but so also is the Orchestra of the Swan under David Curtis. There is a fine cutting edge to the playing, with the tightest possible ensemble and – here the excellent recording comes into its own – a perfect balance between soloist and orchestra. The same is true of the Second Concerto, with for me, ideal tempi. Some might find the Andante a little on the slow side, but this speed gives the music space and allows it to dream. In this same movement, I was interested to find Donohoe unashamedly Romantic in his shaping of the phrases. This is, I’m convinced, as it should be; Shostakovich is surely indulging in a little nostalgic pastiche here, and there is no point in apologising for it! A deeply satisfying disc, well complemented by Daniel Jaffé’s lucid booklet notes.